The band epitomises guitar driven rock’n’roll, an incendiary mix of great beats and riffs, their distinctive brand of melodious bombast is captured perfectly on this live album. Live At The Junction is packed with classy and original rock ‘n’ roll that will grip the listener from the very first hearing and simply refuses to let go, somehow blurring the line between sincerity and audacity. Indulge now in the video for Ways Of Your Love from Live At The Junction. Live At The Junction is the perfect introduction to this fine trio. 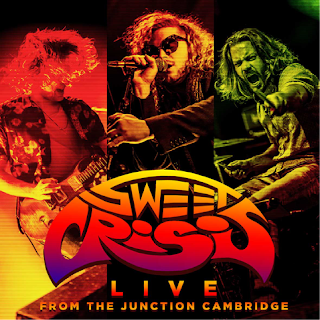 Sweet Crisis are going to save rock & roll with hard luck stories, gritty tales and pitch-perfect riffage. Sweet Crisis are currently recording their first studio album set to be released in early 2018. Live At The Junction album track listing: Awakening. Ways Of You Love. Rapture. Shadows. Take Control. Fight For Nothing. Future Seeds. Last Night A DJ Saved My Life. Last Man On Earth.